As Plus-Size Fashion Gains Popularity, Retailers Play Catch-Up Celebrities like Rebel Wilson and Melissa McCarthy are helping bring plus-size clothing into the mainstream. But most retailers lag behind, making it difficult for women to find clothes in stores. Plus-size women have struggled in the past to find fashionable clothing options. But, with celebrities bringing plus size to the forefront, the fashion industry might wake up. If you're a woman of a certain size, shopping for clothes can be a downer. Even though the average American woman is around a size 14, most department store racks are devoted to smaller bodies. Plus-size actor Melissa McCarthy is about to launch her own clothing line. Another full-figured actor, Rebel Wilson, is designing one, too. Meghan Trainor's smash hit "All About That Bass" is all about having more to love, and People magazine made headlines when it recently put size 22 model Tess Holliday on the cover. There's a plus-size movement afoot. "We want more options in clothing and we want more representation of body types in the media," Holliday said in an interview with NPR's Here & Now. "And I think it would be silly for major designers to not really care about the plus-size consumer, because we have money to spend." On a recent afternoon, there was plenty of foot traffic at Torrid in Gaithersburg, Md. It's a chain known for offering the latest styles in plus sizes. Full-figured mannequins display lacy tank tops, fitted dresses with bold prints and bright colors, and even skinny jeans. Aviva Copaken, 29, was at Torrid shopping for a new bathing suit. She said it's the only place she likes to shop. "It's got really cute clothes that fit me, and I can just go do what I need to do, pick what I need to pick. And it's great. It makes me feel normal," she says. Shopping just about everywhere else, she says, is exasperating. "There's nothing, basically," she says. "I have no choices, and you feel like a minority." The industry has done a disservice to themselves by not offering some of those great choices for the plus-size consumer. "The industry has done a disservice to themselves by not offering some of those great choices for the plus-size consumer," says Marshal Cohen, NPD retail analyst. 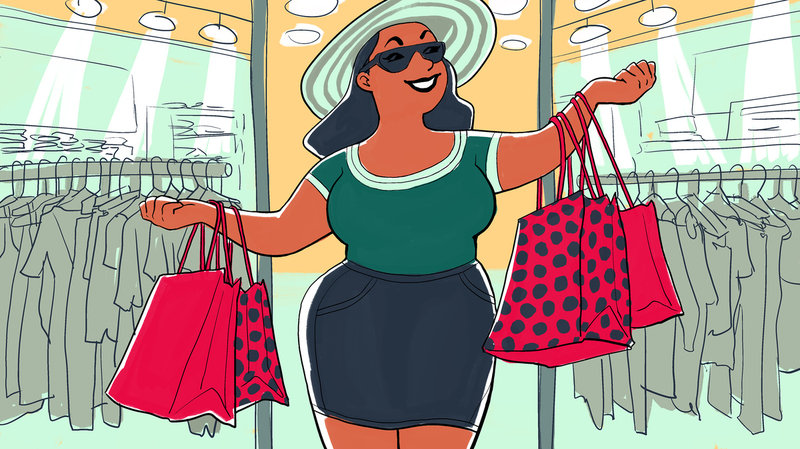 Despite the positive images of full-figured women in popular culture — fashion models, respected movie and TV stars — retail has generally not caught up. Cohen says major clothing stores aren't eager to make a serious commitment to the plus-size market because it isn't growing. "Until the plus-size business grows at a rate greater than its current growth of 2 percent, they are going to wait. And that means that plus size is going to have to accelerate its growth rate closer to 4 and even 5 percent before the retailers are really going to embrace this," Cohen says. That neglect has been a gift for those apparel companies, like Torrid, that do embrace plus-size women. Liz Munoz, senior vice president of design for Torrid, says that when she was growing up, she never found clothes she wanted to wear at the mall, so she learned to both design and sew them herself. Now she's getting paid to do it. "I have the very bad retailers and plus size when I was growing up to thank for my career," she says. "We don't make tentlike muumuus, which is what I had to face when I was growing up." Even veteran plus-size retailer Lane Bryant is trying to be more fashionable. Vogue contributing editor Andre Leon Talley says he was thrilled to see the award-winning designer Isabel Toledo create a range of sophisticated garments for Lane Bryant. "Trench coats, capri pants, fluid dressing, cocktail dresses that were absolutely wonderful — and it's on point. It's anything done for a person who would be wearing a size 8. And I think that probably has taken Lane Bryant in a new direction for its customer," Talley says. Many people reading this story might be thinking that a plus-size movement is not a good thing, given all of the very real health concerns around obesity. But Torrid senior designer Munoz says that's a separate issue. "We're not here to encourage people to be bigger. We're not here to encourage people to be overweight. I think we are addressing the reality of what is going on in our world," Munoz says. Online shopping tends to be how most plus-size consumers answer that perennial question: What should I wear? Sites like ModCloth and Simply Be offer more items in more sizes. Analyst Marshal Cohen says even the large department stores have more offerings on their websites than they do on the racks. For a lot of Americans, he says, in-store shopping is not a positive experience.